BAD!SLAM!NO!BISCUIT! WANTS YOUR WORDS ON STAGE FOR TWO MINUTES WITH NO PROPS OR MUSIC FOR PRIZES. Because BAD!SLAM!NO!BISCUIT! is the poetry slam and it gives you a stage, two microphones, sound, lights, toilets, audience, judges, two and sometimes three MCs, The Score Adder, The Master of Conflict, feature acts and a bar, all for prizes. This month we bring you two feature acts. Feature Act One is Buddy Wakefield, straight from North America to you he brings poetry. In the Fall of 1984 Anchor Bay Entertainment released a movie called Children of the Corn while Buddy lived in front of the corn fields near Niagara Falls, NY. This traumatic event (coupled with extensive exposure to Kenny Rogers and Lionel Richie) may or may not have led to Buddy becoming a sensitive poet puss who plays marbles in the trees, listens by talking, and keeps fingers on pulse. HI MOM! Feature Act Two is Sparkles, BAD!SLAM!NO!BISCUIT! knows not from where she hails but she brings SPARKLES. 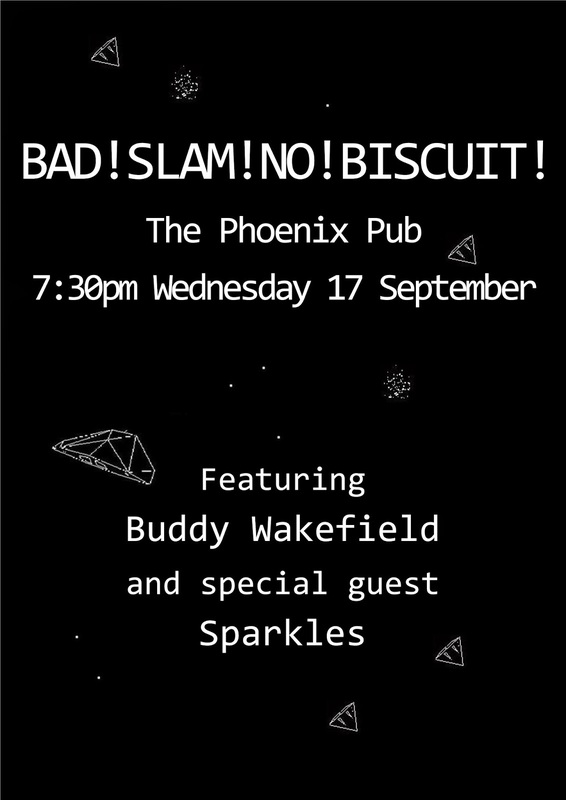 Sparkles has shocked, delighted and disgusted people since her first appearance as a feature act at Bad!Slam!No!Biscuit! in 2011. Since then she has featured in Comic/Strip, the National Multicultural Fringe Festival, the National Folk Festival and a number of Sass and Tease events. Sign-up at 7:30pm, poetry slam at 8pm, finished by 11:30pm, join BAD!SLAM!NO!BISCUIT! at the Phoenix Pub and remember no props, no music and your original material. Also, this is Heat Two of the Australian Capital Territory Australian Poetry Slam. And finally, BAD!SLAM!NO!BISCUIT! is free but until the second half of the Phoenix Pub is re-built we will be requesting donations at some point, give us what you can or can't.